When we are dealing with a violent or potentially violent encounter, we have a few options: flight, redirect, submit, posture, fight, freeze and collapse (here is a good article explaining each). Redirect, submit, posture and collapse are learned behaviors, generally but not always, for dealing with social violence. Flight, fight and freeze are physiological reactions that may happen when we are responding to danger or perceived danger. However, these can be choices too. This physiological response starts with the hypothalamus, which switches on the sympathetic nervous system (SNS) and the adrenal-cortex. Stress hormones are released from the adrenal medulla, the inner part of the adrenal gland. 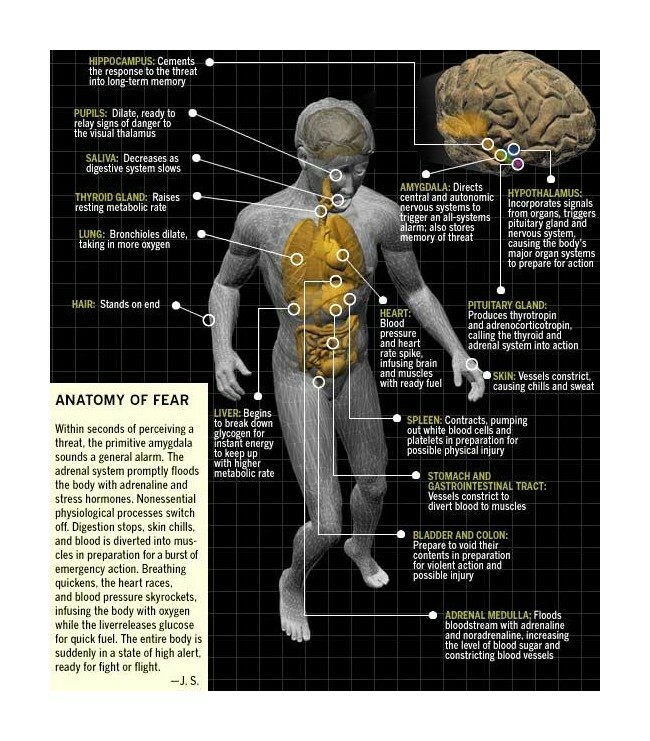 These hormones are called adrenaline (epinephrine) and noradrenaline (norepinephrine). These hormones may have many effects on the body including elevated heart rate, tunnel vision, auditory exclusion, time distortion, memory loss and loss of fine motor skill, to name a few. It’s the onset of these hormones that can cause a fight, flight or freeze response. Generally speaking, everyone freezes. Some people break the freeze within milliseconds while others linger frozen in place for far too long sometimes taking damage. At some point in our lives, we will all have to deal with the freeze response. There are several different types of freezes and the reasons for each vary. Rory Miller has written an in-depth explanation of the different types of freezes and why in his book Facing Violence. Rory’s explanation can be found here on Marc MacYoung’s website No Nonsense Self Defense. For this post, I want to focus on how to minimize the time spent in our freeze response. So if we know that at some point there is a chance we are going to freeze, then we should focus on learning how to reduce the initial shock and break the freeze. This short clip from the movie Hannah, is a good example of the onset of a physiological freeze and the character breaking that freeze. Giving yourself a command helps you focus on what you are doing and/or what you need to do. It is the same concept as talking to yourself through any other procedure. While going through a tactical combat casualty care course (TCCC), I had to perform medical treatments under some intense circumstances like being inside a flipped vehicle or while in the rear of a speeding/swerving SUV. I also had to answer completely unrelated questions while accurately performing aid in spite of having copious amounts of cold water poured on me, at the same time I was being kicked, pulled and screamed at. Talking myself through the procedures definitely helped me complete my tasks without freezing up. So now that we understand some basics about the freeze response and how we can break it, let’s discuss how we can prepare ourselves and minimize it. Philosopher Nassim Nicholas Taleb wrote a book called, Antifragile: Things That Gain from Disorder. In his book, Taleb explains that being resilient is not enough. Although, being resilient means we can handle stress, we don’t actually grow or get stronger from it. Instead of being fragile or resilient, we should strive to be antifragile. This basically means that when exposed to stress or violate situations, we should become stronger. The goal is to be able to thrive when encountering chaos. The Art of Manliness wrote a good article on this concept. The article draws a parallel between antifragile and the myth of the Hydra. When a head of the Hydra is cut off, two grow back; thus becoming stronger. There are plenty of ways to work towards becoming antifragile. One such way is called the “anti-freeze habit.”[4-5] This basically means that when you have an undesirable task to do (getting out of bed, homework, getting into cold water, report writing, etc. ), do not hesitate. Take the task on immediately and vigorously. The idea behind this is that when confronted with sudden and unexpected adversity, the hesitation to respond will be minimal since you are already conditioned to immediately deal with unpleasant things. Also, getting accustomed to being uncomfortable. This is the same as introducing small stressors into your life. One way that I do this is by only taking cold showers. Other ways could be fasting, challenging workouts/hikes or participating in activities completely outside your comfort zone. Another exercise that will help is called visualization. This is playing the “what if” game. Coming up with scenarios and how you would realistically respond. By visualizing high stress situations and working through each step of the scenario, you are pre-loading your mind with answers or near answers to potential high stress situations that you may encounter. This will allow you to make a quicker connection to the response in an actual event. Of course, you can’t rely on visualization alone. It’s always a good idea to incorporate this with scenario training or some type of hands on training. It’s important to note that when using visualization, you need to visualize success and be as realistic as possible with the details. The last exercise I want to talk about for minimizing the freeze response is called stress inoculation. Just as you would get a vaccine to inoculate your body to a virus, you can inoculate your body and mind to, for lack of a better word, combat. Lt. Col. Dave Grossman wrote On Combat and produced The Bullet Proof Mind, which details this type of training is depth. The premise is that while in our levels of awareness, our heart rate is between certain levels. Grossman identified the rates to be: tuned out = 60-80 BPM, relaxed/focused awareness = 80-115, high alert = 115-145, condition gray = 145-175 and comatose = 175 and up. [6-10] Grossman also identified that our optimal performance was in high alert and that once we go into condition gray and comatose we start losing our abilities (fine motor skill, audio/visuals, etc.). This may result in the freeze response. 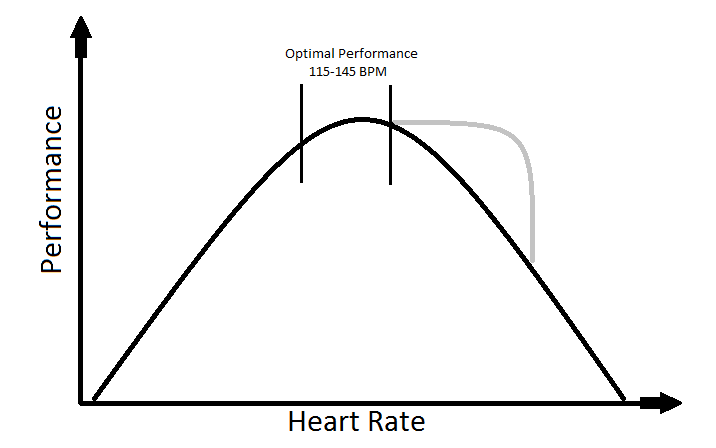 This graph represents our heart rates with our optimal performance. I’m sure you noticed the gray line on the graph. This is where stress inoculation comes in. By participating in stress inoculation training, we can condition our mind and body to push the limits of our optimal performance from high alert (145 BPM) into gray (145-175 BPM). This basically means that when we are confronted with a high stress situation we may be able to avoid the effects from the hormone release while in condition gray. Thus, performing better with higher heart rates and under more stressful conditions. The next aspect to make stress inoculation successful, is the same as with visualization, in the end you must have been successful. [6-10] Beating someone down and calling it stress inoculation will not have any positive effect on the individual (most likely just the opposite). As you can see, by training consistently with realistic training, we can learn to perform during higher levels of stress and keep ourselves from falling victim to the freeze response. This type of training is essentially pushing you toward becoming antifragile. The training won’t be easy nor will it be fun (at first), but it’s definitely worth it in the end.